Cynthea Liu spent most of her formative years in Oklahoma and Texas where she was a member of the Whiz Quiz team, an academic decathlon-er, and a spelling bee champion. Yes, she was very popular. After attending college on the East Coast, she landed a job as a management consultant. When she had enough of PowerPoint and frequent flyer miles, she traded in her suit for sweats to focus on the fun stuff–writing for children. Cynthea is represented by the Andrea Brown Literary Agency, which consistently ranks #1 in juvenile sales by Publishers Marketplace. 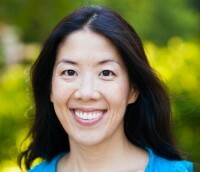 Ms. Liu’s works include contemporary picture books, easy readers, chapter books, middle grade, and YA novels. She loves to write about spunky characters in humorous situations. Her latest picture book, BIKE ON, BEAR (Aladdin, S&S) was named to the 2016 Illinois Reads List and the winner of the 2016 Oklahoma Book Award. Her picture book entitled “Tiana and Charlotte’s Friendship Fix-up” for Disney was featured in the Disney Princess Storybook Collection. Cynthea also has numerous titles with Disney including GUS LOVES CINDERELLA, FLOUNDER LOVES ARIEL, Chip Loves Belle, Mulan’s Perfect Present, and more. Her book, WOOBY & PEEP, a humorous picture book, was published by Sterling. She has also ghostwritten chapter books for a bestselling Disney series, and her middle-grade novel PARIS PAN TAKES THE DARE with G.P. Putnam’s Sons was a Scholastic Book Club selection, an APALA selection, and an Oklahoma Book Award finalist. Her YA novel THE GREAT CALL OF CHINA for Puffin‘s S.A.S.S.bestselling series was a NoveList Grab N’ Go selection and an APALA selection. Her work has been translated into German, Korean, Chinese, and French. Cynthea’s WRITING FOR CHILDREN AND TEENS: A CRASH COURSE (how to write, revise, and publish your kid’s or teen book with children’s book publishers) is available in paperback. You can also get it in the UK! Cynthea is a contributor to THE NEW WRITER’S HANDBOOK, Volume 2, A Practical Anthology of Best Advice for Your Craft and Career, edited by Philip Martin. She also ghostwrites for private clients and publishing companies. Based in Chicago, Cynthea has spoken to a number of schools in Illinois and across the country. She has also been a guest speaker for national conferences organized by the American Library Association, American Association of School Librarians, Association for Library Services to Children, and the Young Adult Library Services Association, among others. Locally and regionally, Cynthea has also spoken for the Illinois School Media Library Association, the Illinois Reading Council, the Illinois State Board of Education, and the Chicago Teacher-Librarians Association. Cynthea is also a frequent guest author for local family literacy nights and young author conferences. She is also a writing coach and faculty member for both local and national conferences associated with the Society of Children’s Book Writers and Illustrators as well as universities and colleges. She has been featured on ABC’s Chicago 7 and the Chicago Sun Times. To learn more about Cynthea and her books, please visit her author website at http://www.cynthealiu.com. A question: Is this website for teens/children who want to become writers? Or is this an adult-writer website? There is no age requirement to become published in the children’s/teen book market. Primary readers of this website happen to be adults as I often work with adult writers as a writing coach. I do also work with younger writers, but that is only with the participation of a sponsoring school. In this industry, the rules for young writers to be published are the same as they are for adults. So all the advice given here applies to young writers as well. Write a great book and publishers will pay attention, regardless of the writer’s age.